Let's say you want to find text that begins with a standard company prefix, such as ID_ or EMP-, and this text must be in uppercase letters. There are several ways to check if a cell contains text and the case of the text matters to you. To do this task, use the EXACT function. 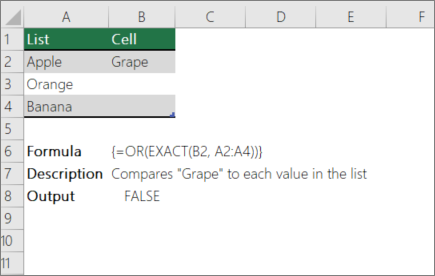 Note: EXACT is case-sensitive but ignores formatting differences. To do this task, use the EXACT and OR functions. 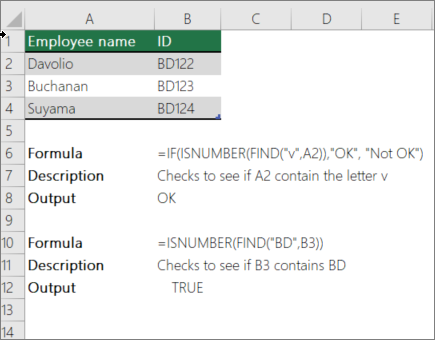 Note: If you have a current version of Office 365, then you can simply enter the formula in the top-left-cell of the output range, then press ENTER to confirm the formula as a dynamic array formula. Otherwise, the formula must be entered as a legacy array formula by first selecting the output cell, entering the formula in the output cell, and then pressing CTRL+SHIFT+ENTER to confirm it. 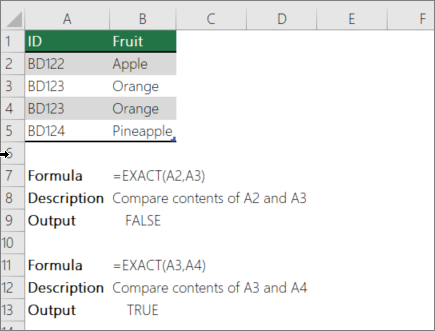 Excel inserts curly brackets at the beginning and end of the formula for you. For more information on array formulas, see Guidelines and examples of array formulas. To do this task, use the IF, FIND, and ISNUMBER functions. The formula in the above screenshot uses the following arguments. search_for: What you want to check for. to_search: The cell that contains the text that you want to check.